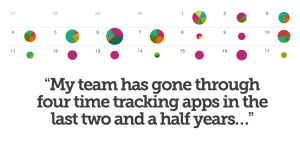 How much time are your employees logging? What’s the name of the client or project? What were your employees doing? Creating a new project or client is easy with Freckle. You do not have to worry about configuring a client account and then configuring projects under that specific client. You can simply just type a name and let the tool do it for you with its “Log It” feature. It has an autocomplete feature as you answer the field information for your client. Freckle also allows you to tag entries, making it easier for you to categorize or filter information. Freckle tries to help reduce the amount of effort that businesses have to spend completing time-tracking tasks. Freckle offers long-lasting login sessions as well as mouse-free time entry forms, making it easier for you to use the tool. It has quick-loading, simple screens. There is no setup required when you use the software. You can create new projects quickly, without having you to configure anything. It can also auto-detect import formats, so you don’t need to select a format. In addition, you can auto-create and archive projects directly from your Basecamp account. There’s no need for you to configure anything in order to generate an invoice. Just click the “new invoice” button you will see from any group, project or report and the tool will generate an invoice taking labels, currency, addresses, and date formats based from the previous invoice you used in that project. The tool is secure: it uses state-of-the-art RAID 10 data storage. The company also makes hourly backups of databases and daily full images saved in Freckle’s servers. Companies have different needs and requirements and no software solution can be ideal in such a condition. It is futile to try to find an ideal off-the-shelf software app that meets all your business requirements. The wise thing to do would be to customize the application for your unique needs, staff member skill levels, budget, and other aspects. For these reasons, do not rush and pay for well-publicized trendy solutions. Though these may be widely used, they may not be the best fit for your particular needs. Do your groundwork, look into each short-listed system in detail, read a few Freckle reviews, speak to the vendor for clarifications, and finally choose the product that offers what you want. How Much Does Freckle Cost? You can try Freckle for free for 14 days. We realize that when you make a decision to buy Project Management Software it’s important not only to see how experts evaluate it in their reviews, but also to find out if the real people and companies that buy it are actually satisfied with the product. That’s why we’ve created our behavior-based Customer Satisfaction Algorithm™ that gathers customer reviews, comments and Freckle reviews across a wide range of social media sites. The data is then presented in an easy to digest form showing how many people had positive and negative experience with Freckle. With that information at hand you should be equipped to make an informed buying decision that you won’t regret. What are Freckle pricing details? What integrations are available for Freckle? If you need more information about Freckle or you simply have a question let us know what you need and we’ll forward your request directly to the vendor.